When I first saw TRAVELER’S notebook at ISOT 2005 (ISOT is a stationery and paper product exhibition held in Tokyo, Japan), there was something in that notebook that made me attracted to it. 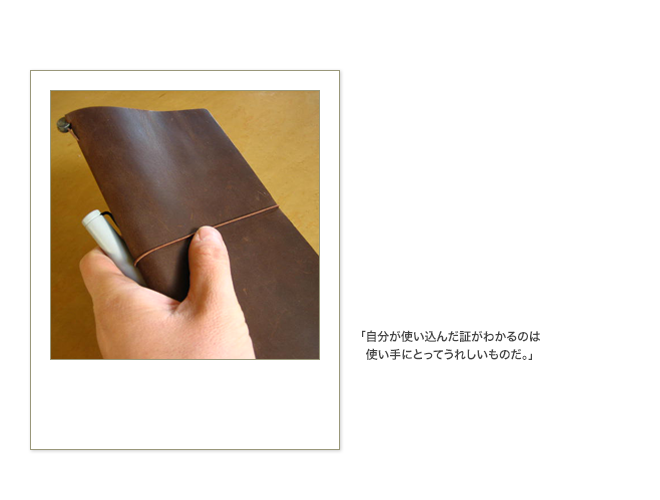 A notebook that uses leather is not special as a feature, but I felt some sort of difference in this notebook. I believe this is coming from the simplicity being pursued in the product. Most of the things we encounter in our daily lives tend to be finished, and I guess that made the simple taste of the notebook appear to have a form of freshness. The rough cutting leather has its side left as is, and the surface is minimally polished. The natural feeling of the leather is left in an adequate level, and this allows it to reflect the level of use in an honest manner. As a user, it’s a nice thing to see the proof of one’s use through the leather. The product is made simply, so it’s possible to customize it in a variety of ways. You can add a pocket to store the documents, and it might be fun to change the color of the rubber band. 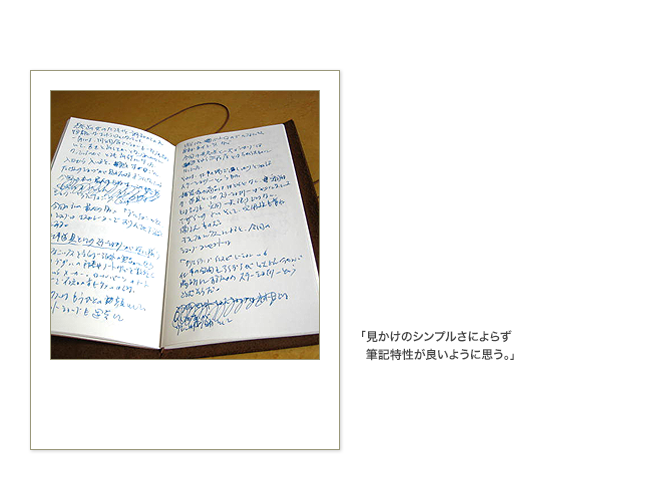 For now, I’m actually thinking enjoying the use of TRAVELER’S notebook as is, and then customizing it. I don’t use this notebook in a special manner. I use this to take notes of meetings I attend, jot down things as a memo, and write drafts for an article. As a person doing business related to stationery, I try various types of pen, and through this, I can say that the notebook has a good writing characteristic given its simplicity. It seems to go pretty well with fountain pens and water-based pens, which are known for having inks that have a tendency of staining on paper. From the name TRAVELER’S notebook, we tend to get the impression that it’s a notebook used for traveling. But when we come to think about it, there are small travels and encounters in our daily lives, and that allows us to realize that this is what TRAVELER’S notebook is for. This is a perfect notebook to carry around and record the small travels that happen in our everyday lives. Born in Kanagawa Prefecture in 1967. 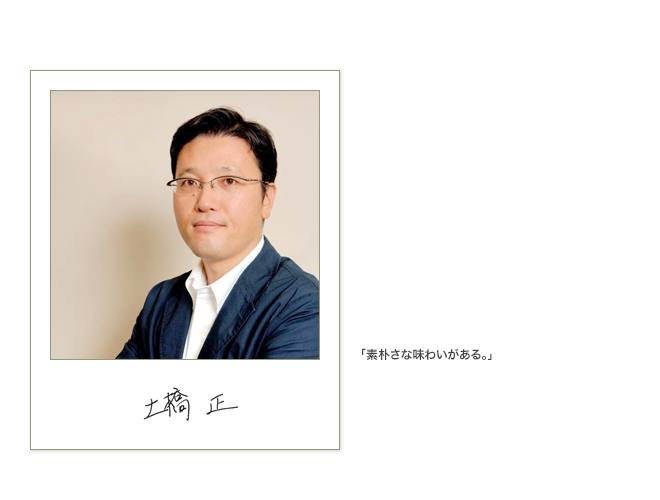 He has worked at the office of ISOT exhibition for the past 10 years. ISOT stands for “International Stationery and Office Products Fair Tokyo,” and is the largest exhibition for stationery and paper products in Japan. Through his career, he has encountered and used various stationery tools, and is currently engaging in a variety of activities including writing and appearing on TV. Published by Toyo Keizai Inc.